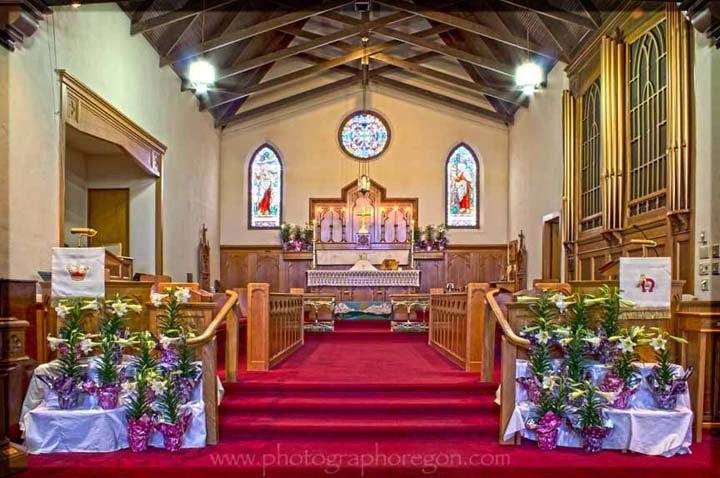 God is alive in Oregon and there are very old active Oregon churches all around our state. I found in Europe that even the local town cathedrals that are thousands of years old often have a vibrant, active congregation with bright fliers and announcements taped to the old stone walls. 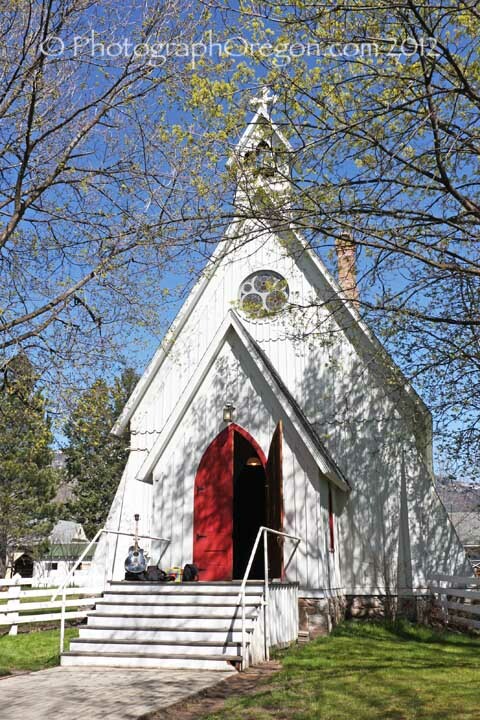 The same is true with many of the tiny vintage active Oregon churches. Well maintained and loved they are everywhere and their people are generally happy to show you the inside and let you photograph. Actually, I’ve never had anyone say no! 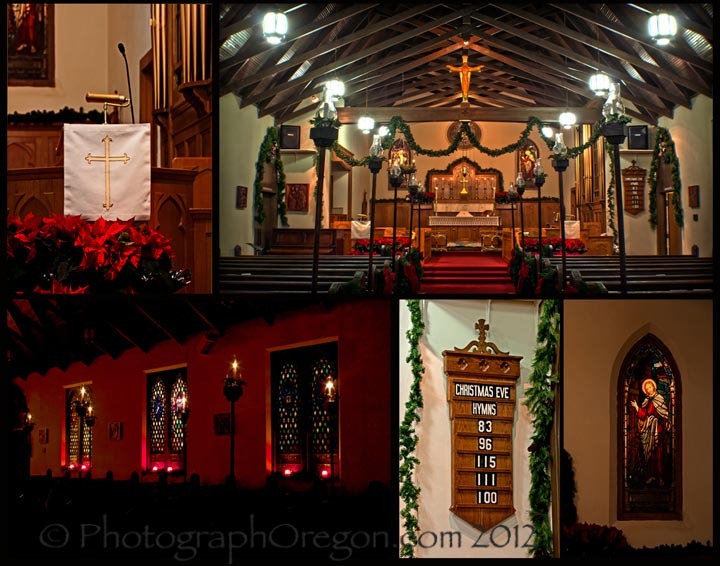 This church gets top billing because it is my church and a very well known active Oregon church. 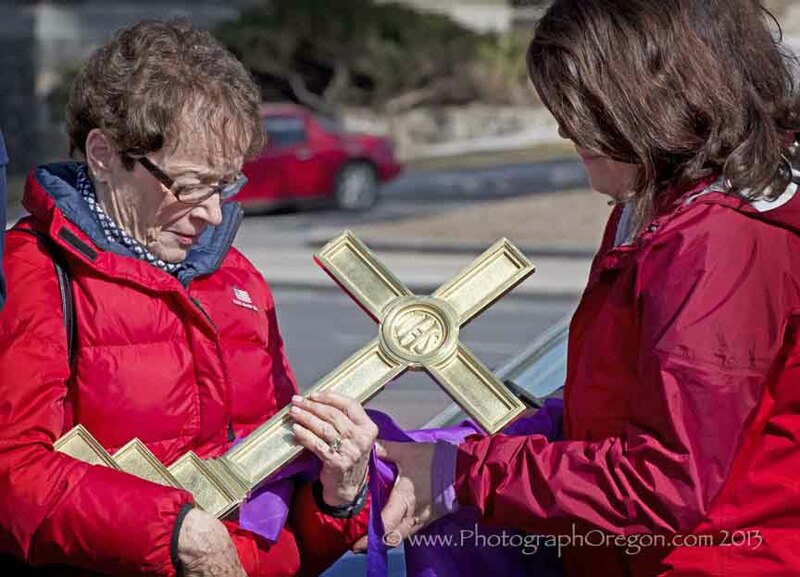 Episcopal services began being held in people’s homes in Bend in 1904. The Episcopal ladies guild was formed in 1908. 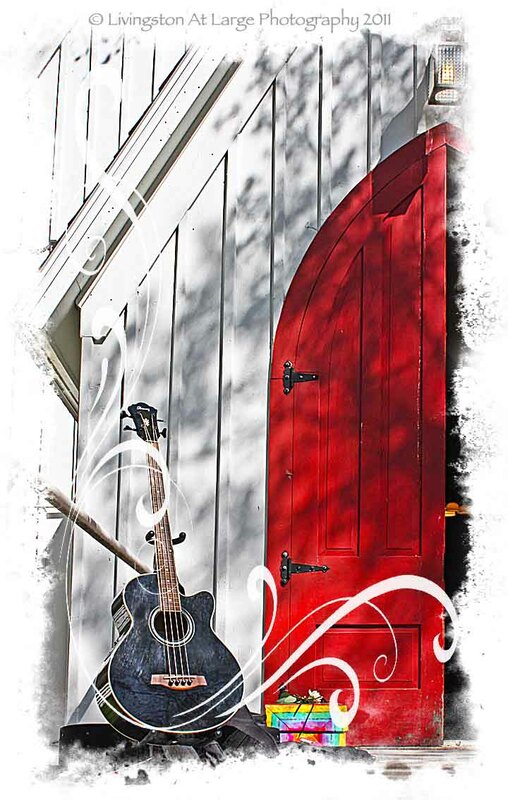 Located at the foot of Wall St. in the heart of downtown Bend, Oregon, it’s referred to by locals as “The Red Door Church”. It smells like warm wood and wax inside and gets beautiful decorations for all seasons. Our triumphant return to our sanctuary. "Welcome Home" The sweetest words. 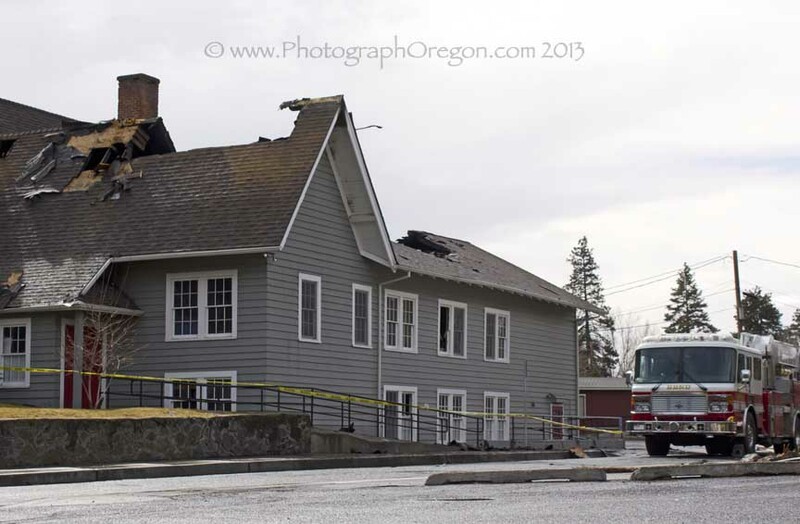 Around 2:30AM on Wednesday March 6, 2013 arsonists set fire to Trinty Episcopal Church, St. Helens Hall and several homes in the area. 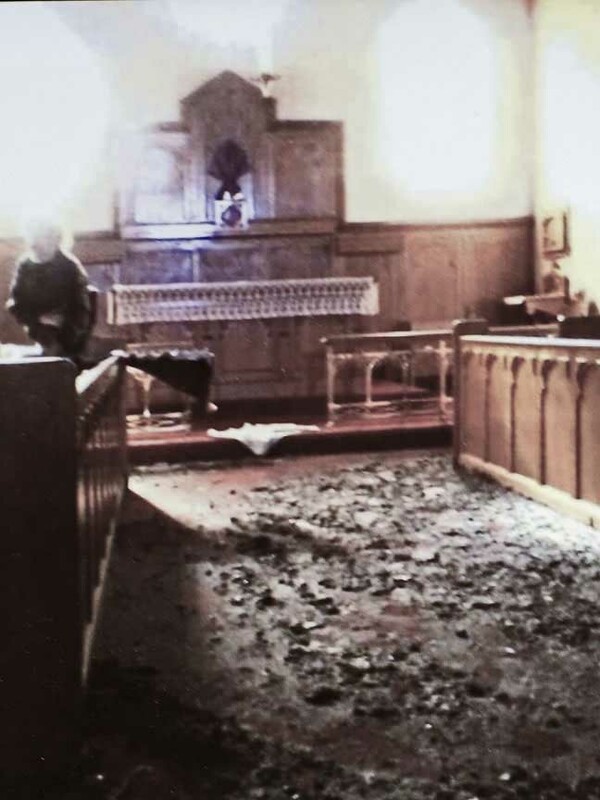 Our beloved church was badly damaged. It's hard to even put in to words how sad this is. I just have pictures to show you. The most heavily damaged part seems to be the oldest section of the original church. These two interior images were taken by Donna Jacobson. You can see there, on the back of the altar, our big cross covered for Lent. Because it was covered, it came out in good shape. Below it is in the loving arms of Julie Lear with Donna checking it for damage. 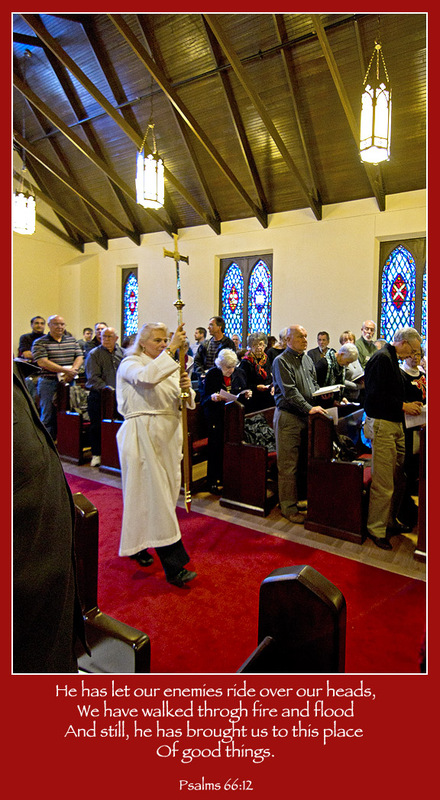 Mark, our sextant (maintenance, and all around good guy) recovers the processional cross from St. Helen's Hall. A big cheer when up when our kneelers came out. These are needlepoint of the Cascade Mountain range. They were made over a period of 10 years by church members. 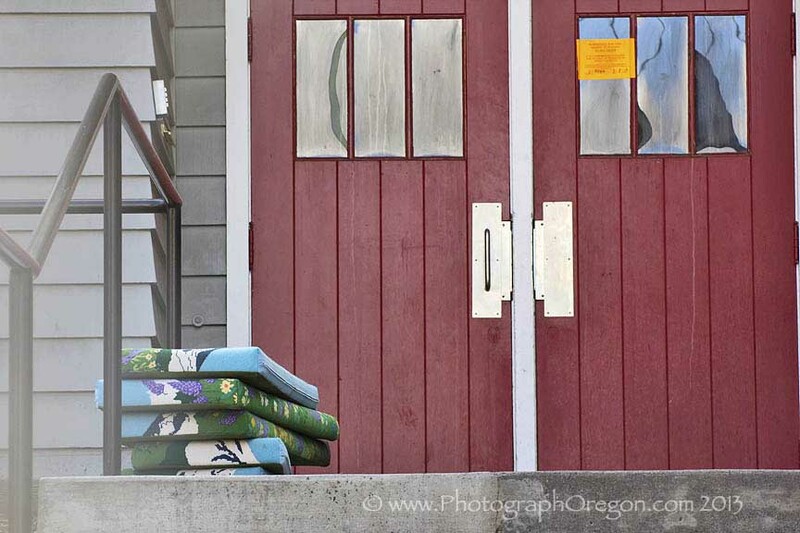 For the moment, a long moment, this active Oregon church, like so many of the people it serves, is homeless. "Persecuted, not abandoned. Struck down, but not destroyed." ...and sits dark and sad until Easter Sunday. Christmas Eve is a magical night for us here and to be able to stay until 3AM photographing while David played carols on the piano was one of the best moments ever. 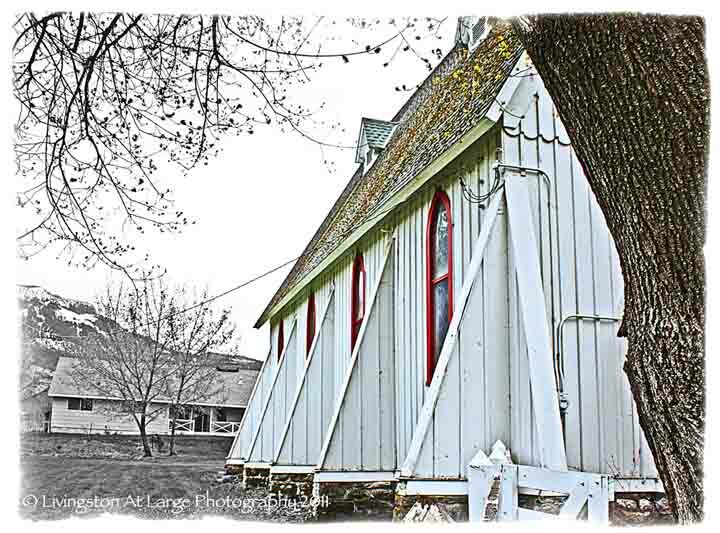 Another active Oregon church who's history I don't know, but I think I can get a hold of, is the Antelope Ghost Town Community Church. I know it was built in 1897 because it's in big numbers on the front! 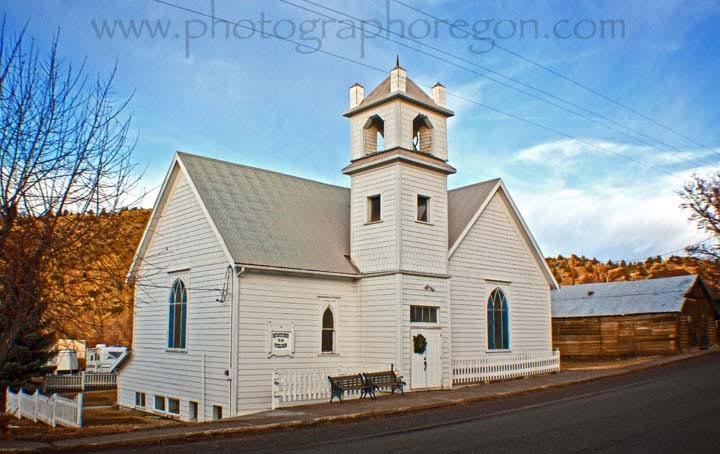 This active Oregon church picked up as we did an impromptu drive through the ghost town of Canyon City, Oregon. It was late in the day so I didn’t get to go inside. I thought it kind of looked like a movie set and several people have asked me that since. It’s real. Here is the side view. 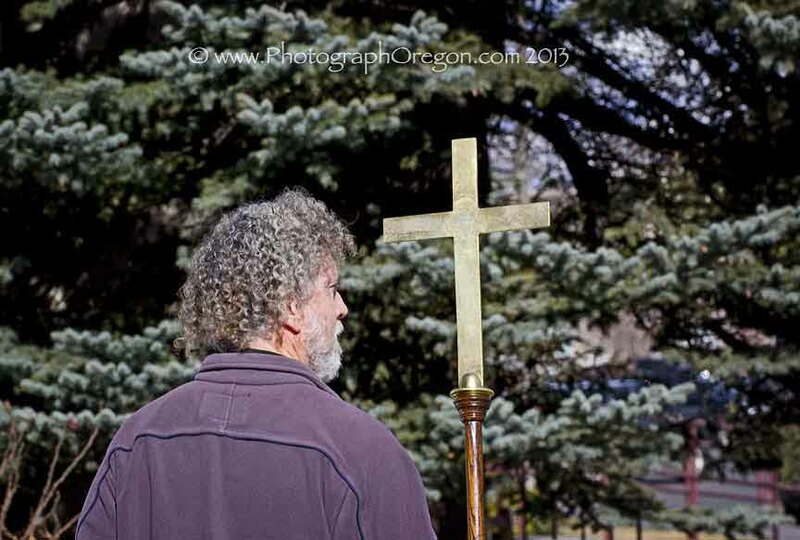 Thanks to a couple great websites there is a fair amount of history on this active Oregon church. 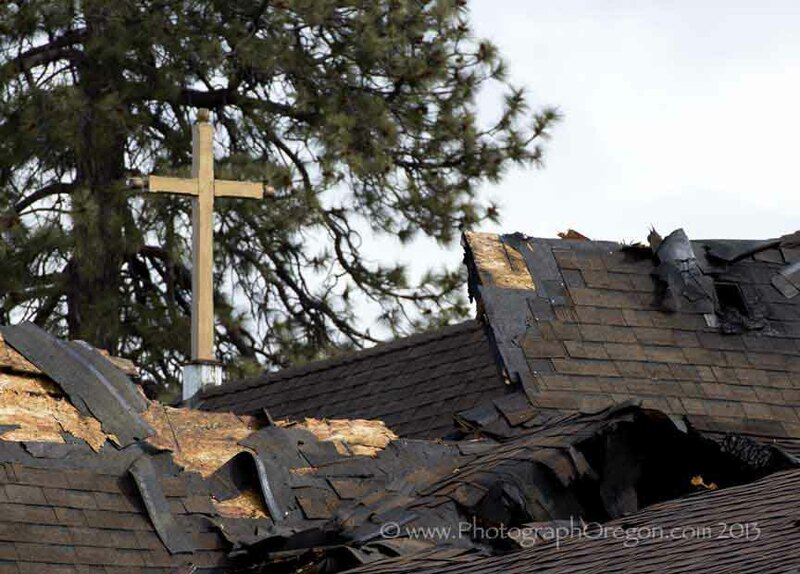 There were several devastating fires in Canyon (originally Canon) City. 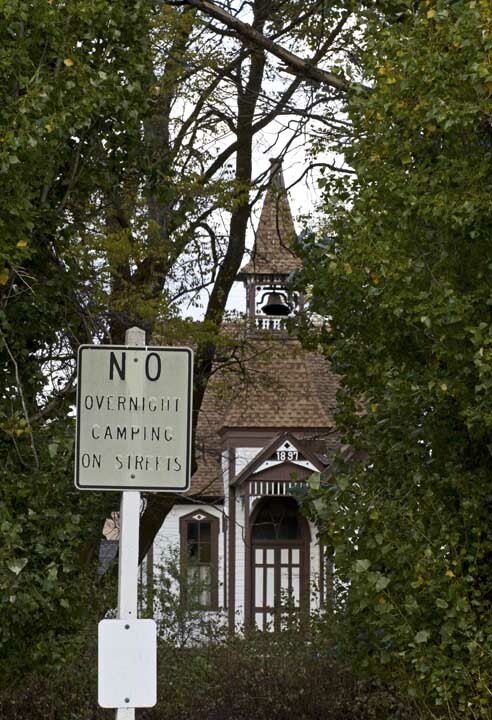 One of the main ones happened in 1870 and cleaned out most of the town. The church was not affected, as it had not been built. However, November 11, 1898, the on a clear wintry evening fire broke out around 10:30PM on the second story of the Elkhorn Hotel. The flames quickly spread across the street to the old City Hotel. The fire spread in all directions eating up all the hard work of the 1870 rebuild. Bucket brigades were formed but the water supply eventually ran out, still, the Episcopal Church was saved. On April 19, 1937, the town was again laid low by fire. Again the fire started in the upper story of the now Hotel Canyon at 6:30 p.m. 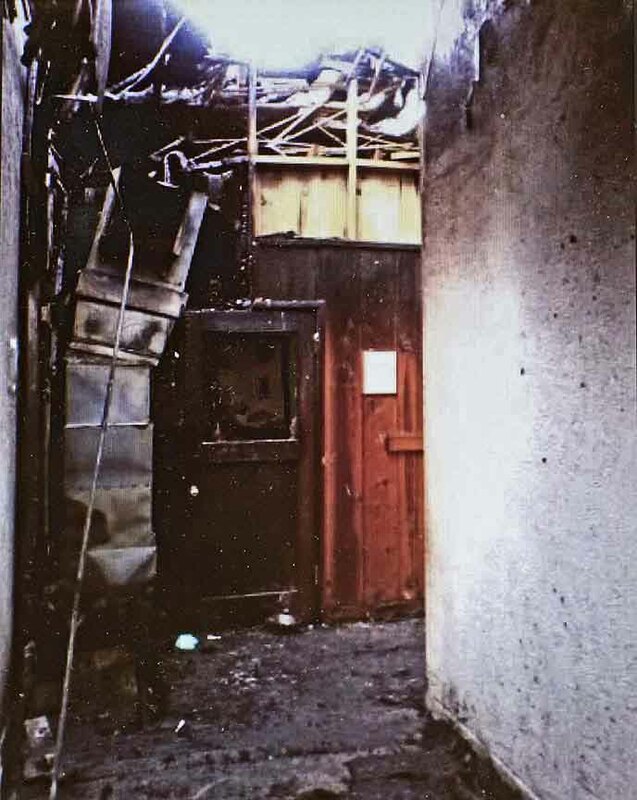 The same location as the 1898 fire. The fire could be seen for 30 miles. 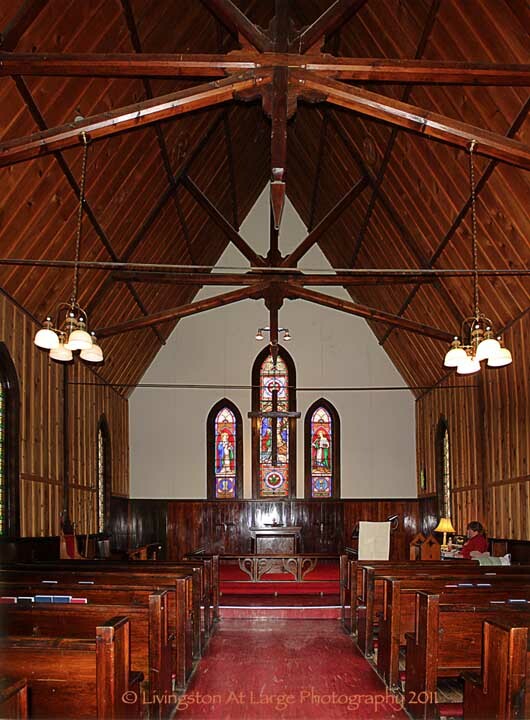 As in the fire of 1898, St. Thomas Episcopal Church was spared once again. It is believed that the water from the small spring behind the Church may have been a factor in its rescue from both of these fires, however, the church has been described by one writer as "consecrated to the Lord and baptized in fire." 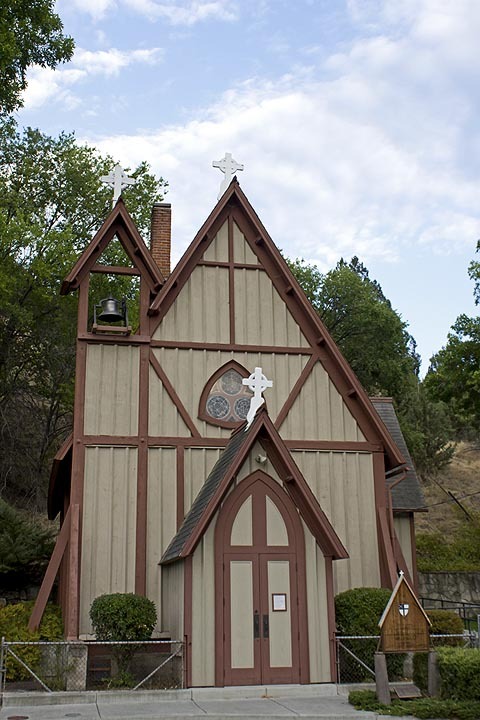 “This quaint, but beautiful, edifice is a living monument to the early pioneering missionaries who came from the East to bring the gospel of Jesus Christ to the rough and tumble mining camps and homesteads of early Oregon. Such a man was the Rev. R. D. Nevius, whose life was dedicated to the work of Christ, and who designed and built St. Thomas, and was her first Rector. We of the present day, seldom think of these men of God being something other than Bible-carrying preachers. The tools of their manual skill were always found beside their Bibles. One block east of hwy 395 in Canyon City. 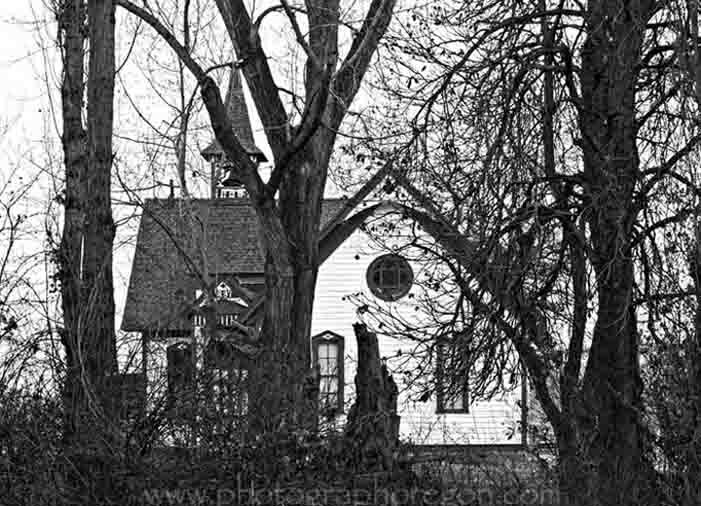 This Cottage Grove Forest Church 16 miles Outside of Cottage Grove on Row River Road on the way to Wildwood Falls. 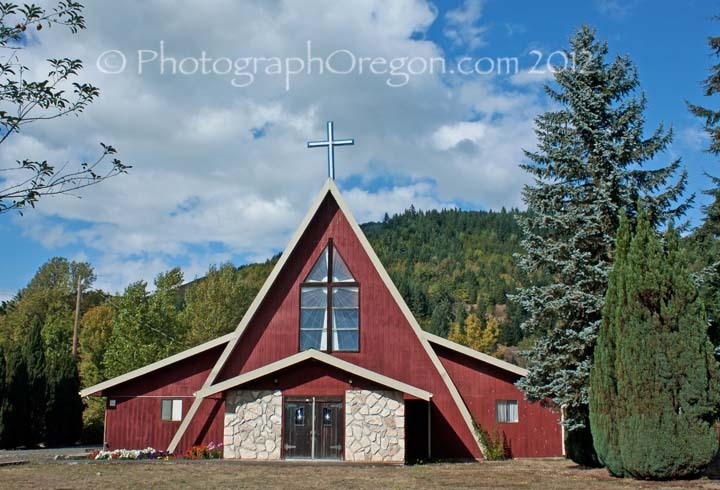 While obviously an active Oregon church…..it’s another church that is hard to find any info on. 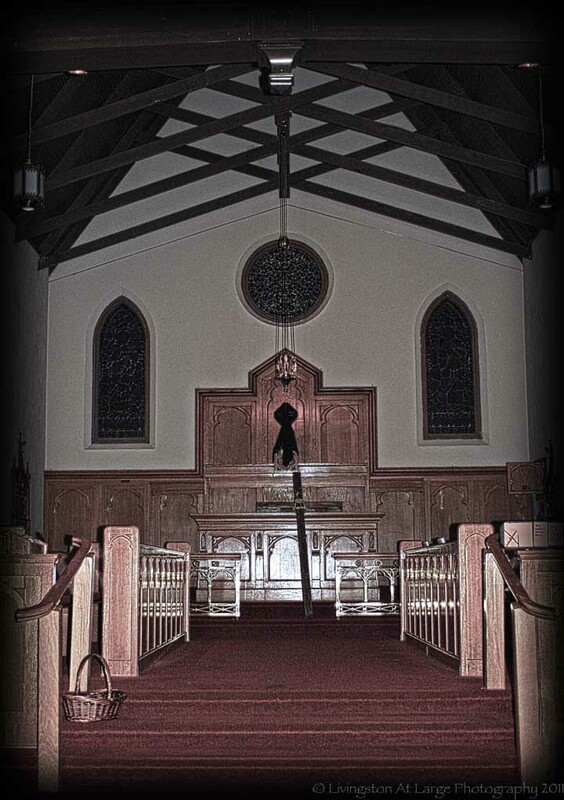 Since it is an active church so I’m sure if I go out there again and stop in I can find something. I just really liked the architecture. *I don’t even know if that’s the name of it. I saw it called that in another image. Head out of Cottage Grove on Row River Rd towards Wildwood Falls 16 miles out on your left. Along the way you will pass several of the Oregon Covered Bridges. 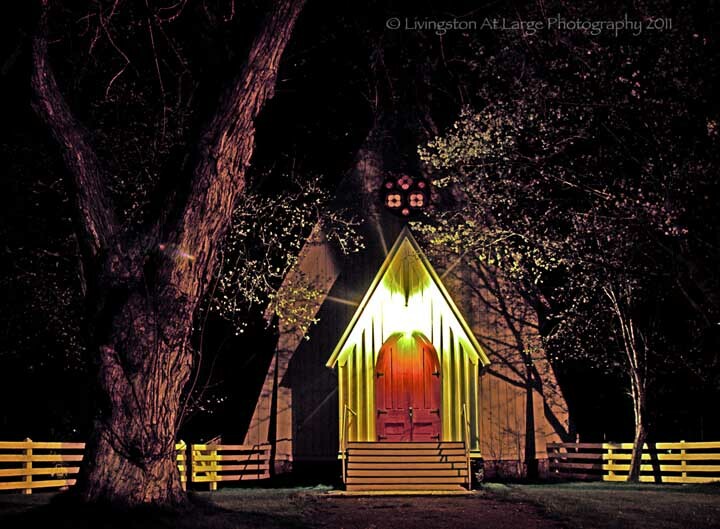 Another one of my favorite active Oregon churches is the camp church on Cove, Oregon. I have had the pleasure of being on retreat here and sleeping in the top bunk of one of the cabins. I'm in love with the little buttresses on the sides. The interior is warm and all cedar so it smells fantastic. There's a wood stove in the back to keep it nice and cozy. At night there are several kinds of lighting so the colors are weird and interesting. It's possible that we were supposed to be in our bunks all night. I thought I was getting away with it until the next day when someone came and asked me if they could borrow my stashed tripod for the group pictures.....uhhhh yessssssssssss. 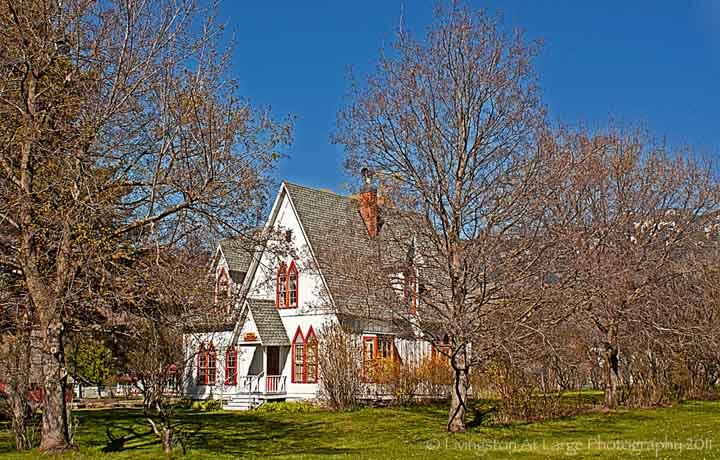 The matching rectory is pretty awesome as well. ...and for my brothers and sisters in the know...Here's a bit of Palanca for you. 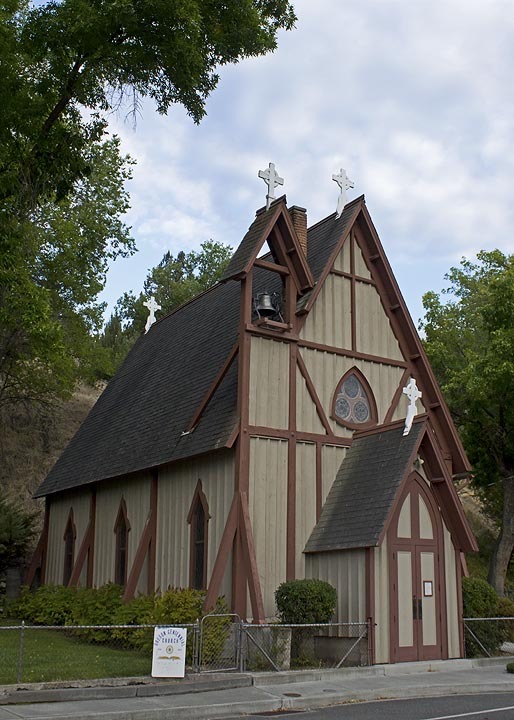 I don't know much about this little church except it is on the back highway (Hwy 62) in to Crater Lake through the town of Ft. Klamath on second st. 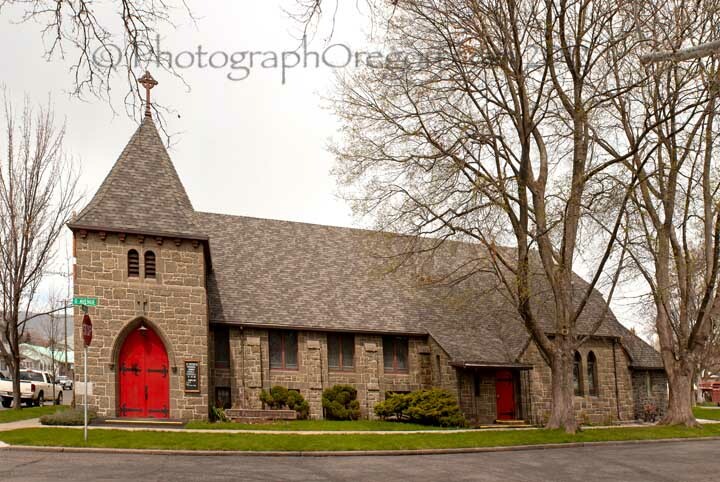 Truly a lovely old stone church built in 1924. 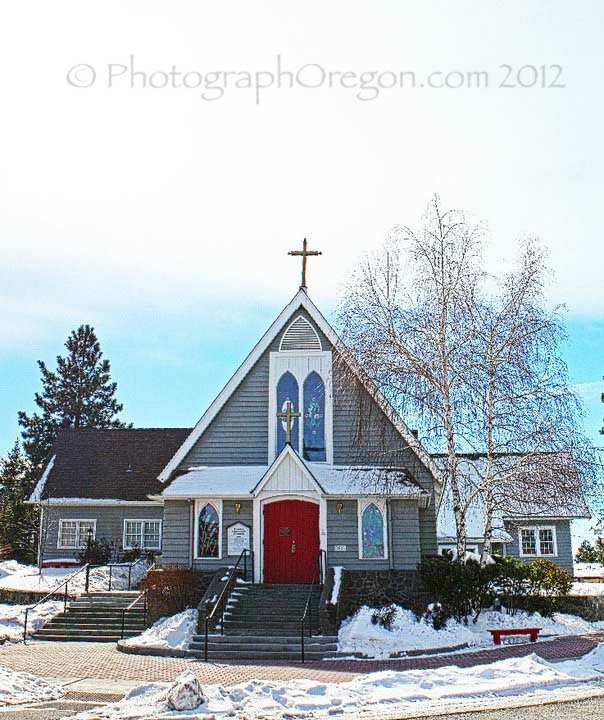 St. Peter's Episcopal church in La Grande, OR is a lovely traditional Episcopal church with really friendly people. I've been there for a soup dinner but the only info I can find on the building history is the year it was built. It is located on the corner of 4th and O street. 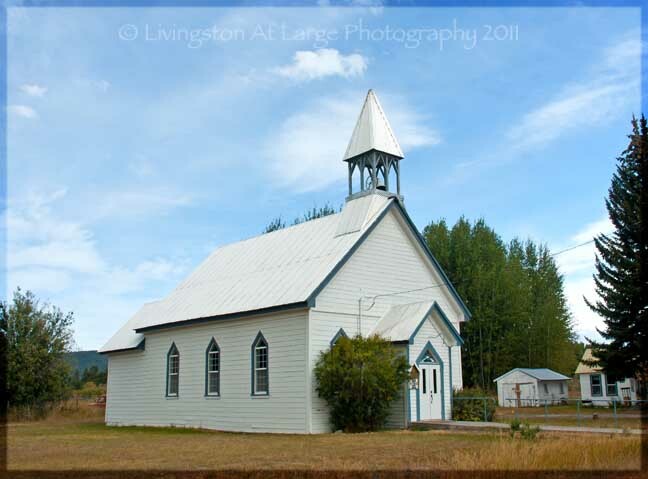 As far as I can tell, this is the Mitchell Baptist Church in the ghost town of Mitchell, OR. We found it driving around in Mitchell on New Years Day after a trip to the Painted Hills.